Found 3 file extension associations related to Qt Creator and 2 file formats developed specifically for use with Qt Creator. Qt Creator is a cross-platform integrated development environment (IDE) tailored to the needs of Qt developers. 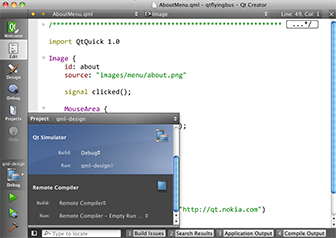 Qt Creator runs on Windows, Linux/X11 and Mac OS X desktop operating systems, and allows developers to create applications for multiple desktop and mobile device platforms. If you need more information please contact the developers of Qt Creator (Nokia Corporation), or check out their product website.